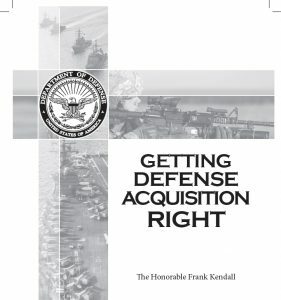 Volumes have been written about the challenge of reforming the Defense Department acquisition process. And while significant progress has been made—cost growth in major weapon system programs, for example, is now at its lowest level in 30 years—the only measurement that really counts is if the things the Pentagon buys increase the combat capabilities of the military. That was the parting shot of wisdom offered by outgoing Undersecretary of Defense for Acquisition, Technology and Logistics Frank Kendall during his final public appearance Tuesday at the Center for Strategic and International Studies. But winning on the acquisition front may get tougher before it gets easier, Kendall warned. The 2017 Defense Authorization Act included more than 100 provisions dealing with acquisition reform, including a controversial provision that splits the Acquisition, Technology and Logistics Office into two separate entities, each with its own under secretary. In addition to congressional interference, which often leads to more bureaucracy and regulation, Kendall said he has concerns about the possibility that the Donald Trump administration may bring in outsiders with little or no technical experience or experience in government.